We make no excuses for it. We love cross-country. And we’re firm believers, it should be tried at least once. Until you’ve felt the mud under your feet (over your feet, up your legs and splattered up your back), you never know it might just be the thing for you! 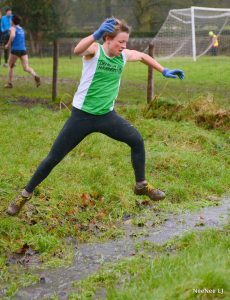 The North Wales & Shropshire Cross-Country League is the main team event in which the club participates. It is a series of 5 races from October through February. Men and women run separately, with the men running about 10K and the women 5k. The club pays for entry and anyone and everyone can take part. Our first club members home are ‘counters’ for our club. For the men, it’s the first 6, women, the first 4. These runners places are added up and are our score for the event. the lower the better. It’s not just about the counters though as non-counters places still count so if you as a non-counter finish above a counter for our rivals, they score higher, that point could make all the difference at the end of the season. We do really all play our part. 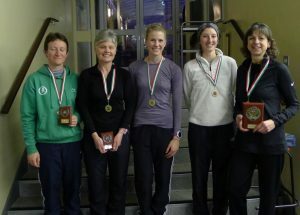 The event is really well supported by all the local clubs and we sometimes win individual or team medals and even promotions. 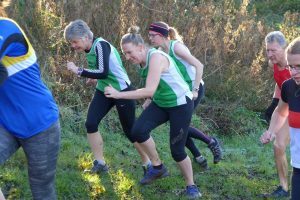 The ladies compete in Division One, men Division Two.